The first term is finished which means that summer is on its way out. EOGA had a fantastic season and we’re still going to make the most of the beautiful next couple of months before the cold hits us. 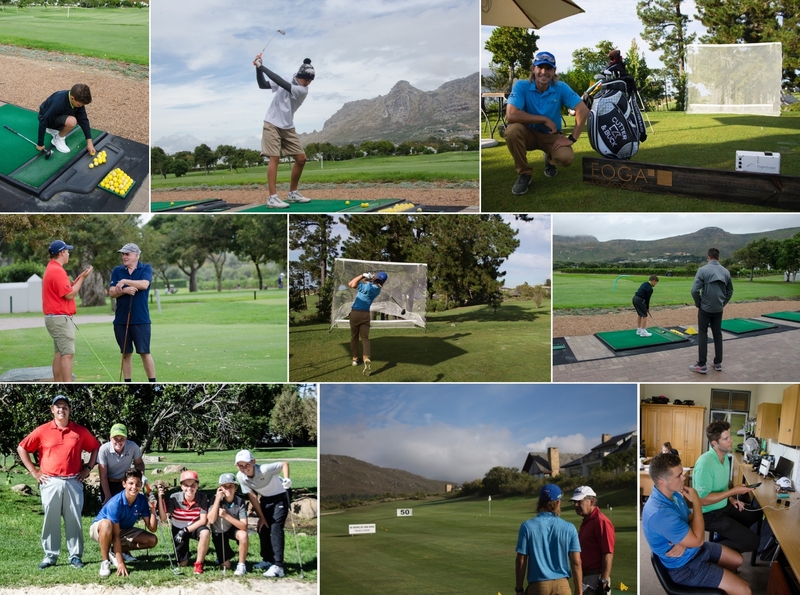 We had our Target 36 launch where families came together and started their golfing journey. Many juniors were there and we are excited to see their progress. 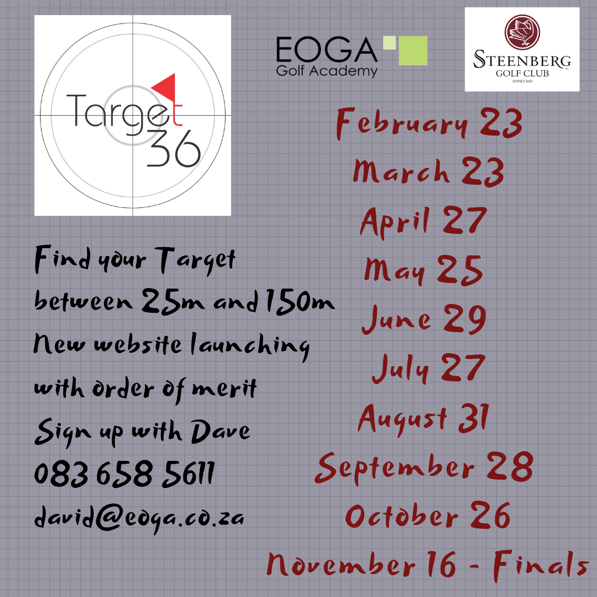 Here are the next dates for Steenberg Target 36. Book and see your golf improve! Email david@eoga.co.za. 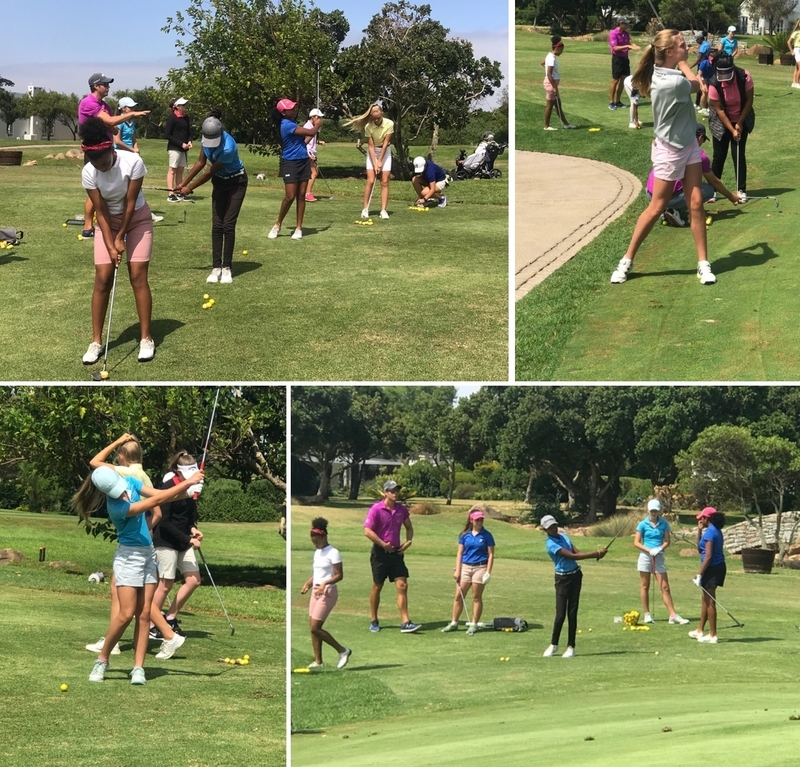 We continued our training with the Western Province Girls Squad at Steenberg. They truly are an excellent group of young women all working together to achieve their full potential! St Patricks’ Day challenge! 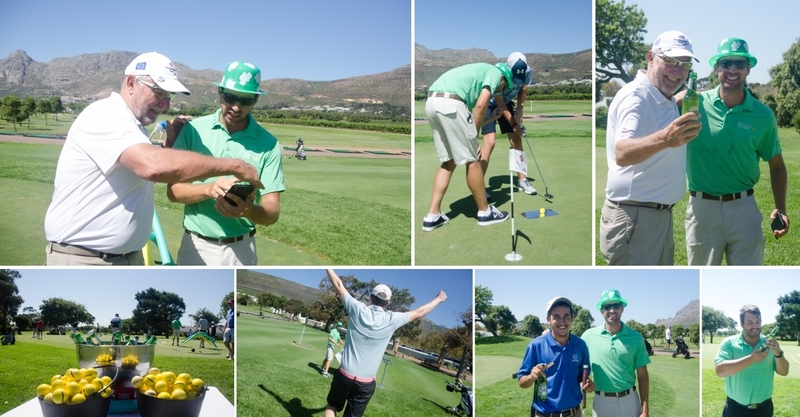 The players had to hit the ball into the pot of gold and earn their liquid gold (read: beer!). We had some very happy members! Thank you David for organising such a fun event and thank you to Nico van Blerk for the lovely photos (he is our non-official photographer when available!). Murray and John are kept busy on the course in Somerset West. They’ve been busy with the Ladies’ Clinics and the Juniors and lots of private coaching, from beginners to professionals. We’re getting excellent feedback from our clients and it warms our hearts to see the difference we make in their game. This next stretch will be busy with some Junior Camps during the school holidays. John is an absolute gem with kids and once your kid meets him, there will be no turning back! 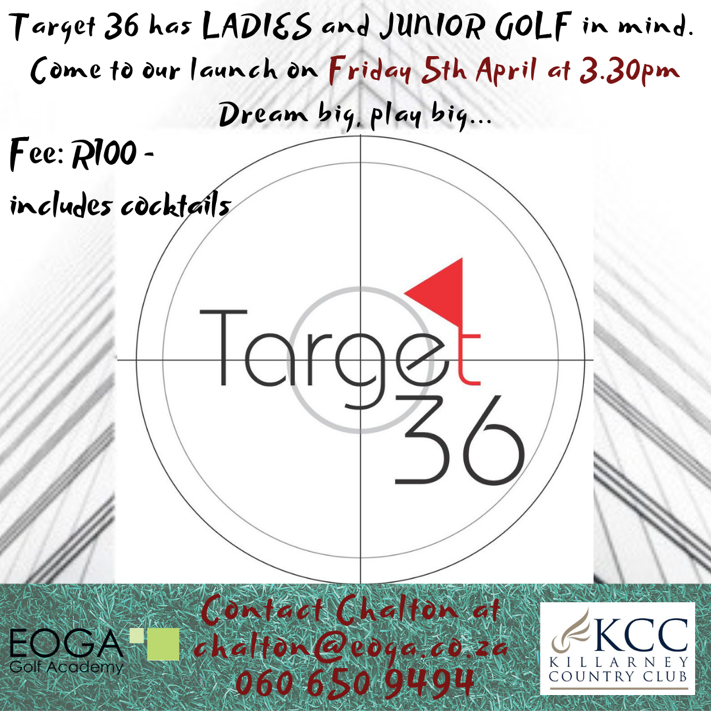 Another event happening at Erinvale this month is our Target 36 launch. 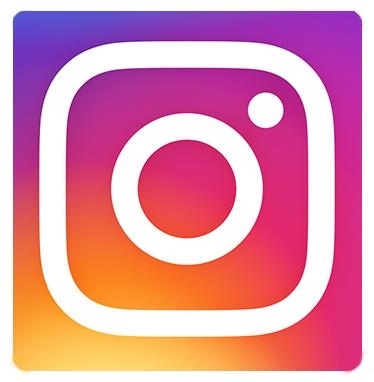 Once you’ve attended the launch, you will not want to miss out on the follow-up events! Diarise! We are so pleased about the growth at our EOGA Killarney site. Chalton has been working hard at the club not only with our clients, but also in having the studio renovated. It’s starting to look really good! The lightning and rain have been a bit of an obstacle and the Target 36 had to be postponed. However, Capetonians have learnt to be grateful for every drop of rain (even if it is in Joburg!). So a new date has been set already and fear not, Target 36 is coming to Killarney! Target 36 is a great way of introducing, promoting and growing golf, especially for Ladies and Juniors who are not quite ready for playing on course yet. It is also a great way to build into families who like to play golf together. Make your booking with Chalton. 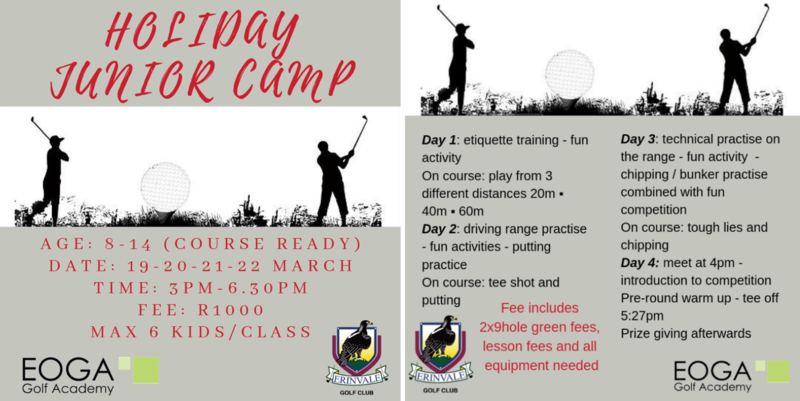 Also exciting this month at Killarney is our 2 Juniors Clinics during the school holidays. 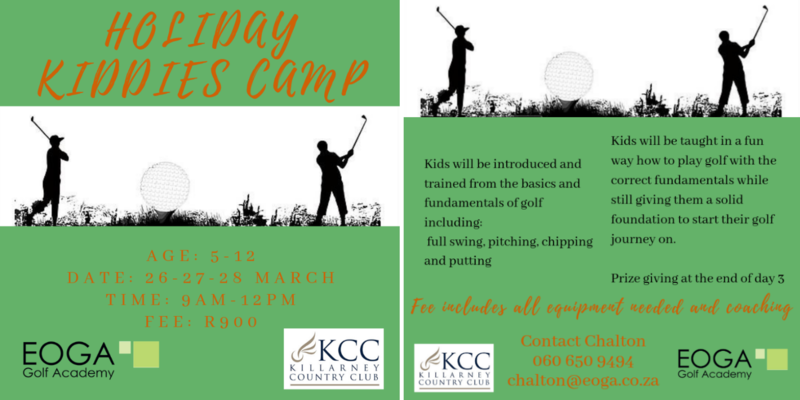 Chalton has a really fun and challenging program for the young golfers. The Junior Clinic is happening every Wednesday afternoon. Last week we focused on chipping and pitching. We make sure to incorporate lots of fun games to keep their full concentration as well as pressure drills. What a great bunch of youngsters! The Juniors of the Academy are improving at great speed! 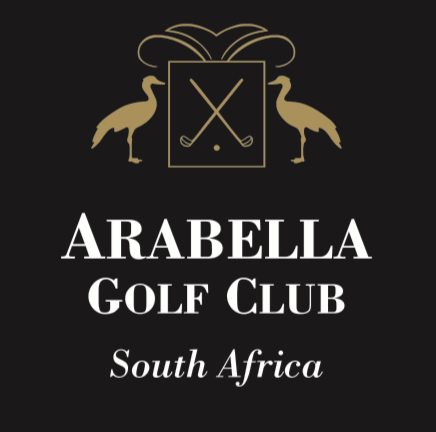 Next week will be their first time playing on the Arabella course. Pictured above is little Morne doing what he does best. What a great swing he already has! 6 years old and loving it already! On Friday, for St Patricks’ Day, we organised a couples challenge. The members dressed up and enjoyed the scramble format with their partner. Pictured below was the set up on the 5th hole: EOGA coach André sponsored champagne and the tailgating game. Not a bad set up for a Friday afternoon golf challenge! Teams Gail and Paul, Gary and Nico, and Thea and Johannes all took just 28 shots to complete their round. We all had a lot of fun and many thanks also go to Mike Munro and the Arabella kitchen staff as the players were treated to some cocktails and nachos to enjoy afterwards! 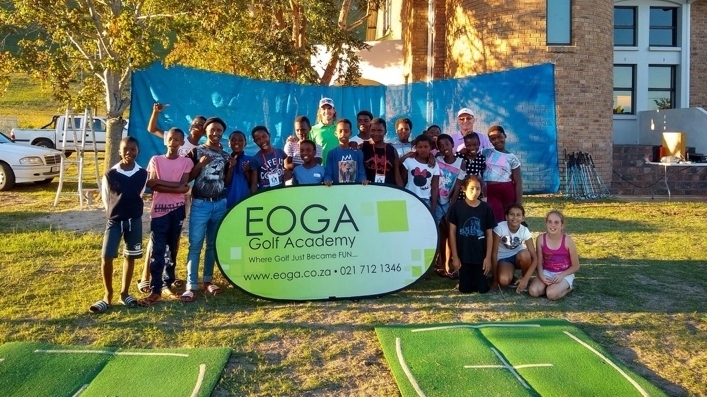 EOGA also got involved in the Kleinmond community and André had a first meeting with the kids of Kleinmond to introduce them to golf. Kleinmond Fellowship Church arranged with André to have a few sessions together. It was a great turn out, the kids had a lot of fun and some of them displayed some promising good skills! The weekly Ladies’ Clinic is running smoothly. They’re meeting every Thursday 9am – 10am. André is doing a fantastic job with the lady members. He’s seeing a lot of improvement and camaraderie on the course! EOGA is getting involved close to town. We now have a presence at the Metropolitan Golf Course. Our coach Ryan Randall is taking care of this new site and we will have more news about the up and happenings of this prestigious beautiful new site. There will be more about this new site in our next newsletter. Kieran Urquhart (left) is still winning. This young man won the Western Province (U15) interprovincial in Worcester. Chalton (right), our EOGA Killarney coach in Johannesburg is standing next to Josh van der Wath who won the Killarney Country Club Junior Club Champion. We are very proud and excited with him! Apologies for the blurry picture but Gary Murphy (far left) with EOGA coach André at Arabella Kleinmond won the Match Play Club Championship. He was unbeaten and won a few great players by showing his class. André (middle photo, left) is posing with Gail Witcomb with a big smile as she accepts the trophy for winning Club Championship! Congrats Gail! Also in Arabella Club Championship, Thys Lourens (far right photo, left) wins Men B Division and Reinold du Randt (right) is the runner up.